The company is planning to set up a manufacturing unit with an investment of about Rs 15 crore that will have a capacity of making 50,000 units per year. 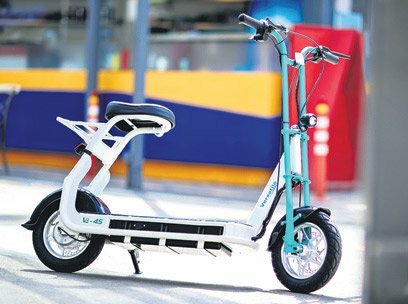 Hyderabad: Versatile Auto Components, a Hyderabad-based plastic and metal components company serving automotive sector for over a decade, has developed VE-45, a short distance commuter electric scooter, developed as a means of personal transport. The company is planning to set up a manufacturing unit with an investment of about Rs 15 crore that will have a capacity of making 50,000 units per year. Fresh funding which will go into land acquisition, plant and machinery will be managed through a mix of debt and equity. The company has spent Rs 6 crore so far into the venture, funded entirely through internal accruals. Founded by the first generation entrepreneur Chandu Kumar Potti (hailing from freedom fighter Potti Sriramulu’s family), his team spent four years to develop the electric vehicle with its prototype ready in 2016 and the scooter went through a series of tests in the last 18 months. The company has developed ten vehicles to start with as a first step. The vehicle is largely indigenised barring few imported components. The team has been responsible for the entire value chain-design, development and manufacturing. The vehicle can run 45 km per charge and comes with dual brakes that ensure effective braking. The single-seater vehicle can carry a load of over 150 kg and provides optimum safety to the owner. The vehicle is priced at Rs 20,000. The company’s vehicle can also be used in large corporate campuses, making the commute pollution-free. It can also be suitable for college students, who otherwise commute by hanging over buses, travelling on footboard, making it risky, he points out. Chandu who is an MBA has created a team of 150 that is looking to disrupt the electric vehicle space.